Shuffleboard table sales are on the rise now that a variety of sizes are available. Shuffleboard table sizes from 9′, 12′, 14′, 16′, 18′ 20′ and 22′ with finishes from Cherry, Espresso and Maple are now common. 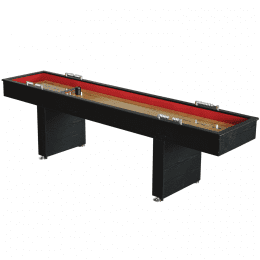 When planning what size space is required for your shuffleboard table simply add 4′ to 5′. 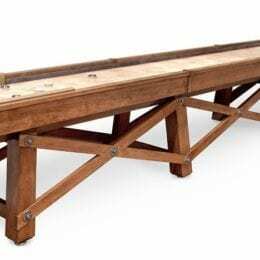 A 9′ size shuffleboard table will require 13′ to 14′ total length. 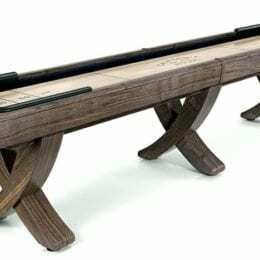 Their are two types of shuffleboards available a home line which has a 15″ wide board made from 1-3/4″ thick solid wood or particleboard. 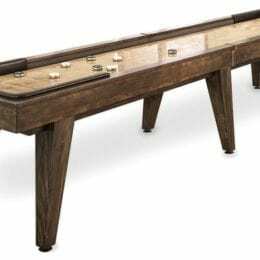 The second is a professional type shuffleboard table that features a 20″ wide by 3″ thick solid wood board.